Fluance RT81 review | What Hi-Fi? Fluance is a Canadian hi-fi and home cinema brand that has been growing ever since it was founded in 1999. According to the company’s website, ‘flu’ is Latin for ‘flowing’ or ‘wave’, while ‘ance’ is Latin for ‘state of being’. While we’re not sure what the brand is getting at, its debut in our our testing rooms makes us hope we see and hear more in the future. 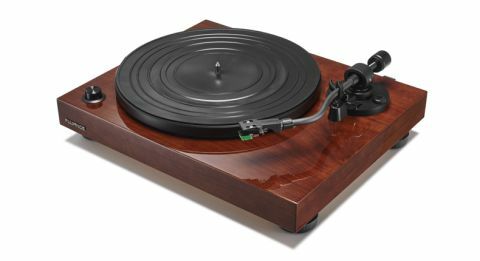 The RT81 is the more expensive of a pair of turntables offered by Fluance - and certainly it looks, and feels, the part. A solid block of MDF (with a convincing wood veneer) sits elevated on four isolation feet, and is crowned with an aluminium platter and rubber slip mat (as opposed to the felt alternative included with the more affordable RT80). Fluance also uses a balanced aluminium S-shape tonearm, to which you fit the Audio Technica AT95E cartridge with its elliptical diamond-tipped stylus. To the right of the platter is a chunky dial for switching between 33.3 and 45rpm. We sense the RT81 is a serious product. Fluance is serious about design, about engineering and about performance. But this is still a relatively affordable deck, and the Canadian company hasn’t ignored simplicity on its list of priorities. It’s close to plug-and-play, save for attaching cartridge, belt and platter. At the rear of the plinth there is a pair of analogue terminals with grounding post, one switch to toggle between phono-level output or line-level output (the latter deploying the integrated Texas Instruments phono stage), and another to switch the auto-stop function on or off. But still, the best thing about this turntable is its performance. It does everything really quite well. We begin with The Twilight Sad’s Nobody Wants to be Here and Nobody Wants to Leave - and what strikes us first is the weight of the sound. It’s hefty and it’s authoritative, kick-drum and toms trading blows as an army of reverb-drenched guitars marches overhead. We’ve heard decks that aspire to this sort of substance before, but what sets the RT81 apart is its organisation and agility. Even when dealing with a chunky presentation, it doesn’t slur or soften its syllables. Nor does it become clogged when we want for movement or texture. Dynamics are another strong point. While it’s difficult to strip James Graham’s effusive vocal of its emotion, the Fluance gives a performance that is convincing both dynamically and musically. These strength are confirmed further by a change of tack, as we slip Masayoshi Fujita’s Apologues from its sleeve. As Fujita’s mallets strike the vibraphone, the varying intensities are not lost - while the RT81’s considered sense of timing confidently tracks the ebb and flow of each movement. One of Fluance’s biggest problems with the RT81 is pitching it into an ever-growing market. Rega and Pro-Ject tend to dominate at this sort of money. The standard Rega Planar 1 does, of course, require a phono stage, whereas the RT81 has one built in - but the performance upturn in pairing it with even a budget pre-amp is felt across the board. While still perhaps less full of body, the Rega is faster, more agile, more detailed and yet more expressive. If you can extend your budget, the Rega Planar 1 Plus (with integrated phono stage) comes into contention, delivering a performance of across-the-board competence the Fluance can’t match. For similar money, and with phono amp included, there’s also the What Hi-Fi? Award-winning Audio Technica AT-LP5 and Sony PS-HX500 worthy of serious consideration - and both offer digital ripping too. Yet the Fluance RT81 will find its audience. It is an instantly likeable deck, one we would happily take home. It can be easily upgraded, either with an improved phono stage or cartridge, and its aesthetic coherence is among the more convincing at this price. If you covet a warm, solid-sounding turntable with plenty of musical talent, it’s time you introduced yourself to Fluance.